This region lay at the heart of modern Germany. During the early Roman period it had been home to Celtic tribes such as the Chatti, Helveconae and Helvetii, but they were edged south and westwards by the advance of Germanic tribes. At the height of Charlemagne's Carolingian empire, Franconia formed the heartland of East Francia. This was the eastern half of the empire, consisting of territory that largely formed the later Germany. The Franconia region was heavily settled during the sixth and seventh centuries, and it was the Franks who gave it its name. Franconia as a word is composed of three parts: 'frank', meaning 'free', a plural suffix '-on' (which in its modern form is '-en'), and a Latin suffix denoting a country or region, '-ia', supplying 'Frank-on-ia'. This is revealed in the German word still used today, Franken (for example in the modern region of Unterfranken), which simply refers to the Franks themselves. Franconia was bordered by Saxony to the north, Thuringia to the north-east, and Alemannia (Swabia) and Bavaria to the south. The Franks who created it were one of several West Germanic federations, and were formed of various Germanic tribal elements, with at least the Bructeri, Tencteri, Tubantes, and Usipetes coalescing to form the Ripaurian Franks who remained on the east bank of the Rhine while their counterparts crossed into Gaul to found the original Frankish kingdoms. 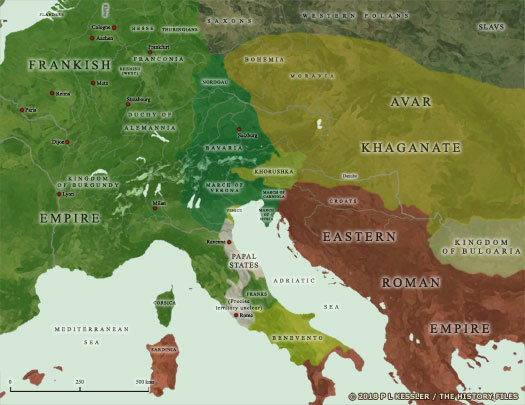 The Frankish conquest of the Alemanni in AD 496 led to that tribe's absorption into their expanding kingdom by AD 505. It seems that their subsequent migration southwards left areas of the east bank of the Rhine around the River Main confluence relatively empty and ripe for settlement. The now-vast Frankish state was divided upon the death of Clovis in 511, with the northernmost and easternmost territories going to Austrasia. In 531 the Thuringians were similarly defeated, apparently with the Austrasian Franks ruling the region directly, without appointing any sub-kings. This seems to have been the point at which Franks also started to settle the territory between the former Alemanni lands and the Thuringians themselves, in time creating a region that became known as Franconia. Franconia remained an eastern region of the kingdom of Austrasia during the supremacy of the Merovingian Franks. In 751, with the Pope's blessing, the Carolingian mayor of the palace deposed the Merovingians and took control of the empire. The sub-kingdoms of Neustria, Austrasia, and Burgundy were now controlled directly, and the name of Austrasia faded from common usage. In 840-843 the empire underwent a fairly messy division, with large chunks of former Austrasia now falling within East Francia. Following the fragmentation of the Eastern Frankish kingdom in the late ninth and early tenth centuries, Franconia emerged as a large stem duchy while the Germanic Roman empire was being formally secured by purely German rulers in favour of the former Frankish rulers. Thereafter Franconia survived until another great political collapse in German lands in the thirteenth century. The name Franconia survives today as a region of northern Bavaria, which encompasses the eastern half of the former duchy. It encompasses three Bavarian administrative regions, these being Lower Franconia (Unterfranken) to the north-west, which contains the important medieval city of Würzburg (former residence of powerful prince-bishops) and which borders Hesse, followed by Middle Franconia (Mittelfranken) to the south, which encompasses Nuremberg and which borders Baden-Württemberg to the west and Bavaria 'proper' to the east, and finally Upper Franconia (Oberfranken) to the north-east, which contains Bamberg and Bayreuth and which has Thuringia above it and Bavaria again to its east. The original pagi in Franconia were as follows: the pagus Nafinsis (Nahegau) and, to its east, the pagus Wormaciensis (Wormsgau), these being the two Franconian pagi which lay to the west of the Rhine during the early Carolingian period, within the ecclesiastical diocese of Mainz. The counties of Veldenz and Leiningen, and the territories of the Wildgrafen and Raugrafen, developed in the area of Nahegau. Speyergau lay to the south of Wormsgau, on the west bank of the Rhine. Nordgau in Alsace lay below Speyergau. Ufgau was on the east bank of the Rhine, to the east of Speyergau. Rheingau lay along the eastern bank of the Rhine, east of the towns of Mainz and Worms, and north of the small area of Lobdengau. Maingau lay directly to the east of Rheingau, and south of Weteneiba. Northern Franconia consisted of (from west to east) the three areas of Engersgau (later the county of Wied), Lahngau (later divided into Niederlahngau, in which the counties of Diez evolved in the northern area and Weilburg in the south, and Oberlahngau, which became the county of Gleiberg), and Hessengau (around the towns of Fritzlar and Kassel). Grabfeldgau formed the northern part of eastern Franconia, south of Thuringia, with Saalgau to its south. South-eastern Franconia included Waltsazi, Weringau, Gozfelt, and Iphigau (west to east). To their south lay Wingarteiba, Tubergau, Gollachgau and Rangau (also from west to east). The southernmost part of eastern Franconia consisted of Elisanzgau, Breitachgau, Scuciengau, Murrachgau, Jägestgau, Cochingau and Mulachgau. The local dialect in modern Franconia is Fränkisch (a division of the East Franconian group), which can sometimes be a little hard to understand for those who are familiar with standard German, although it is not as different as Bavarian. People have a tendency to pronounce a 't' like a 'd', a 'p' like a 'b', and sometimes a 'k' like a 'g'. This is also often noticeable when Franconians speak foreign languages. The prevalence of spoken English is around average for (West) Germans, with higher averages in the big cities and university towns such as Erlangen. Records for the territories in Germany before the twelfth century can often be somewhat patchy, and the list of Franconian rulers is one of the better examples of just how patchy. There are several apparent gaps, although this seems to be the result of Franconia's failure to emerge as a powerful duchy in its own right, and therefore the absence of its own ruling house. Duke of the River Main territory of Austrasia. 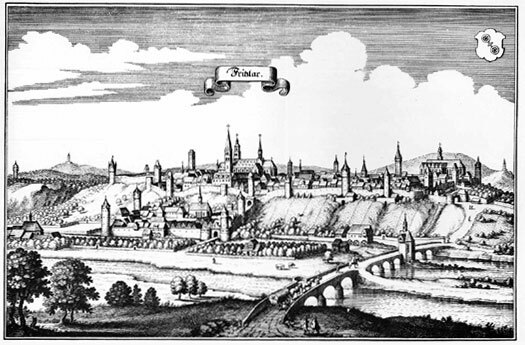 Towards the end of the life of Dagobert I of Austrasia, possibly around AD 634, he appoints one Hruodi to command the River Main region from its capital at Castellum Wirziburc (Würzburg). For almost a century now, Franks have been settling along the course of the Main, gradually securing more territory towards the east. Starting off around the Lower Main near its junction with the Rhine, these settlers have advanced to the Upper Main's great arc and have reached the River Regnitz around the Bamberg area. Early in the seventh century, Slavs begin settling to the north-east, so Hruodi's appointment is an attempt to stabilise this eastern area of Austrasia that is gradually becoming known as Franconia. Hruodi may be the same figure as the powerful Duke Radulf of Thuringia, but is more likely to be a counterbalance to him, in order to prevent him from adding to his own territory in a region in which firm borders have yet to be established. One theory equates Hruodi with Chrodebert of Alemannia (circa 615-639). There is certainly some similarity in the way the names are pronounced, but there is no evidence to support the theory. However, Hruodi's family certainly do have associations with Thuringia as well as with the River Main region around Würzburg. Hruodi's son, Hetan, is referred to as a duke and is placed at Castellum Wirziburc, the castle of Würzburg (this construction is replaced in the sixteenth to eighteenth centuries by the Marienberg Fortress). There is simultaneously a Hetan governing as an independent duke in the neighbouring Thuringian lands, making it highly likely that they are one and the same person. This begs the question of whether Hruodi really is Radulf or does he replace him in Thuringia, expanding his own domain possibly at the behest of Dagobert's Austrasian successor, Sigisbert III. Son. Duke of the River Main territory of Austrasia & Thuringia. As recorded by the Passio Kiliani, Gozbert is 'duce... Gozberto filio Hetanis senioris qui fuit filius Hruodis' and is based at 'castellum... Wirziburc' (Duke Gozberto, son of Hetan the Elder [to differentiate him from Gozbert's own son of the same name], who is the son of Hruodi, based at the castle of Würzburg [and apparently also duke in Thuringia]). Gozbert cannot be a popular leader as he is killed by his own followers. His wife, Geilana, dies after being 'invaded by a malign spirit', while Hetan the Younger is expelled by the people of eastern Franconia. Hetan is also named as a duke, but his son, Thuringus, is not, suggesting that the family are removed from this office (they certainly appear to be removed from their responsibilities in Thuringia - see the events of AD 719). St Boniface of the church at Canterbury, 'Apostle of the Germans', founds the first permanent bishopric of Würzburg. Burchard is the first incumbent. In or soon after 742, St Willibald founds another bishopric at Eichstatt which includes within its borders the south-eastern regions of the still-forming Franconia. Count in the Grapfeld (Grabfeld), north-eastern Franconia. 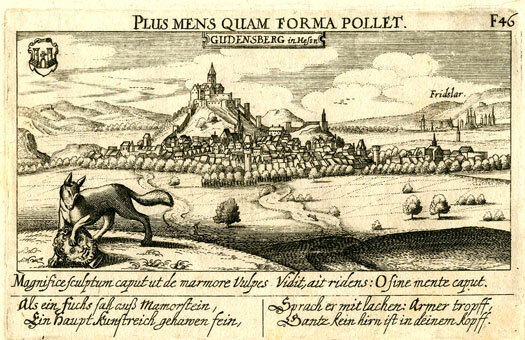 Poppo I, count in the Grapfeld (Grabfeld) in north-eastern Franconia, is apparently the first to command this region which borders Thuringia. He is the grandson of Heimrich, count in the Upper Reingau, a gau being an official term for the various districts within Frankish Germany at this time. Each gau is administered by a count (graf). The Reingau district controls territory that later forms part of Hesse. His own sons or grandsons probably include Henry of Franconia (count in 882-886), and dukes Poppo (II) and Egino of Thuringia. The Babenbergs, possible descendants, play an important role in the early creation of Austria, although this branch cannot definitively be linked to the Franconian Babenbergs. Gebhard of Logenahe, count of Nieder-Lahngau in what later becomes Hesse but which at this time is within Rhenish Franconia, is a 'leading man of the [Eastern] Franks' and brother-in-law to Ernest, margrave of the Bavarian Nordgau. He may also be the son of Odo I, count of Orléans if he is identical with Udo the Elder, count of the Lahngau until 826. However, given the dates, he may instead be Odo's grandson. In this year, 838, he becomes allied to Poppo of Grapfeld in Franconia and Archbishop Otgar of Mainz against the rebellious Louis the German. The intention is to support Frankish Emperor Louis the Pious, a cause which is largely successful. The first count of Franconia appeared in the early or middle part of the ninth century, one Bogo. This was part of a process that was taking part across East Francia as the slow but inevitable collapse of the Carolingian empire continued. Regional figures of authority emerged as central authority became weaker and divided, before control was taken entirely out of Frankish hands. Naming conventions (plural) are fascinating, both in Anglo-Saxon England and in Frankish Europe at this time. In the early phases, there's still use of the common warrior tradition, most of which vanishes over time, except for a few names such as Charles (Karl, Ceorl). These single word (often single syllable) names were replaced by more the frequent use of combination names. Bogo and his successor (after one other), Udo, are really singles, as the -o is merely a nominative suffix. Eberhard and later names such as Frederick are two word names, and therefore more cultured, more advanced, so to speak. It also appears that the definitions of Latin titles had gradually altered. A count is a comes, which refers to a (warrior) companion (of a higher leader). A duke (dux) is a regional war leader or military commander with a defined base of operations, as distinguished from one who moves around wherever he is needed at the whim of the Roman Senate, a consul. However, by the ninth century the title of comes appears to be in use by similarly 'fixed' regional leaders, although a hint of the old order is maintained in the fact that, just about always, a comes is eventually promoted to a dux', or a county to a duchy. The new territory of Franconia was one of several regional counties that were being formed during the break-up of East Francia. The process was not a smooth or entirely controlled one. 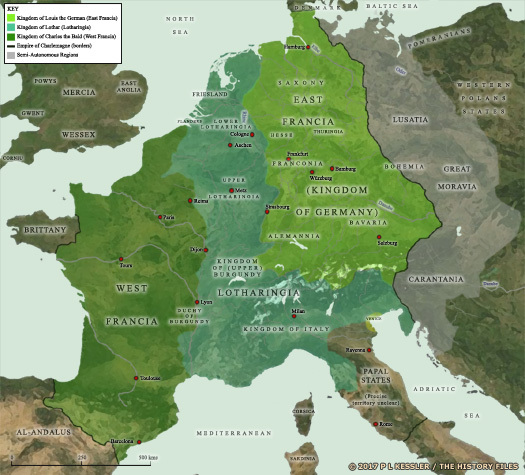 There were several fits and starts as the various Frankish powerbases jostled for superiority, but the main trigger for the emergence of some areas, including Franconia, may well have been the Treaty of Verdun of AD 843. This confirmed the official division of the empire between Charlemagne's surviving three grandsons, with rule over the empire as a whole being nominal. Lothar received Middle Francia (the Rhine corridor, the kingdom of Burgundy, and Italy); Charles the Bald received Western Francia (France and the duchy of Burgundy), as well as holding onto Aquitaine; and Louis the German received Eastern Francia, including Alemannia (Swabia), Bavaria, Khorushka, and Saxony, plus regions that were seemingly already emerging as Franconia and Thuringia). Franconia gained its first count very soon after this, although exact dating and specific information is very thin on the ground. It seems that the process of the empire's breakdown also resulted in a level of clerical breakdown too. Borders were shifting, territories were gaining new rulers, and the existing members of the nobility were often too busy engaging in warfare against their competitors to worry about making a record of any of it. Count in Franconia. Possibly Count Udo in the Lahngau? Bogo has been impossible to identify in any form, but there is a strong possibility that he is in fact Udo the Elder, count in the Lahngau, a powerful figure in western Franconia. The Lahngau later forms part of the Hessian state, so he has been shown there, but as his successors there are Gebhard (Eberhard I?) and Udo, it is likely that the names shown here as his successors are in fact counts of the Lahngau. Same as Gebhard, count of (Hessian) Nieder-Lahngau? Son of Gebhard. Count in the (Hessian) Lahngau. III of Germany. Ruled part of Lotharingia. Empire (901-905). 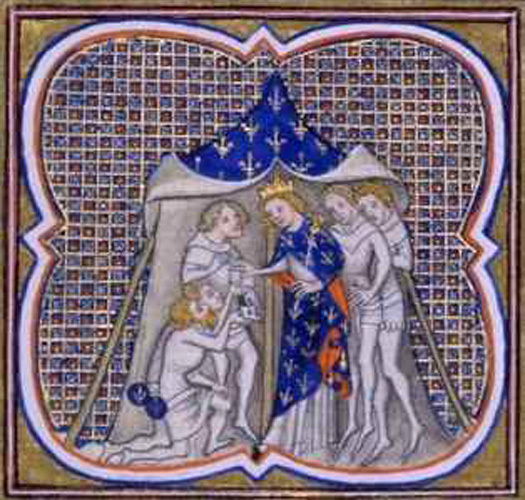 It must be Charles who appoints Henry of Babenberg, his right-hand man, as the acting count of Franconia. He may be the son or grandson of Poppo I, count in the Grapfeld in early north-eastern Franconia before the entirety of Franconia had emerged as a single region in its own right (see above). Babenberg Castle lies on the banks of the River Main, with a growing settlement around it that eventually forms into the city of Bamberg. The Babenburgs also play an important role in the early formation of Austria, although this branch cannot definitively be linked to the Franconian Babenburgs. As for Henry, he is killed in 886 whilst fighting the Normans. III of Germany, France 884-888, Italy 879-888, III of Empire 881-888. Count in Charles' name Son (?) of Poppo I of Grapfeld. Killed. The rule of Germany falls to non-Frankish emperors when the weak Charles III the Fat is deposed by the Germans at the Diet of Tribur (November 887). the Frankish empire is officially divided between East and West. The western section becomes France, the eastern section Germany, with the title of Roman Emperor also being held by Germans. Charles the Fat takes refuge in the monastery of Reichenau in Alemannia (Swabia) where he dies the following year, while Franconia is now elevated to one of five powerful duchies. The new territory of Franconia was one of several stem duchies that were in the process of being formed during the break-up of Charlemagne's Carolingian empire. The first count in what became Franconia had appeared in the first half of the seventh century, following a slow progression of Frankish settlement eastwards along the River Main from its junction with the Rhine. The first count of Franconia as a whole was appointed in the mid-eighth century, at the same time as figures of authority were emerging in the other German regions as central authority became weaker and more divided. Medieval Franconia emerged as a stem duchy from the fragmentation of the Frankish empire when the Eastern Frankish kingdom of Germany was formally secured by German rulers. As with many territories at this time within the later Germany, there was a good deal of disorganisation in Franconia. The German states were drastically reorganised, in some cases disposing of former Germanic tribal affiliations. The new duchy, one of five and therefore extremely powerful in medieval Germany, included the Rhenish Franconia region which would eventually be dominated largely by the Hessians and the Palatinate. The duchy of Saxony lay to the north, and Swabia and Bavaria to the south. Thanks largely to the fracturing of the Frankish empire and the emergence of regional variations, Frankish identity was already undergoing a significant shift during this period. Descendants of those Franks that had settled the region from the sixth century onwards were now being referred to as Franconians, East Franks, or even Germans, forming an emerging German national identity that would take several centuries to fully coalesce. However, Franconia suffered from being the power base of several Germanic emperors. For this reason it was never able to form its own dynasty of dukes that would ensure a focussed effort on securing its borders and also dominance over the other stem duchies. The result in AD 949 of a chaotic internecine German conflict was that Franconia itself was fragmented and the title of duke lapsed until 1024. The duchy was divided into West or Rhenish Franconia (Francia Rhenensis, essentially meaning Franconia near the Rhine, a proportion of which went into forming the later state of Hesse), and East Franconia (Francia Orientalis, an echo of the now lapsed East Francia in terms of its name alone), with the eastern half controlled directly by the German king. It may have been at this point in time that East Franconia came to be considered by the bishops of Würzburg to be within their sphere of authority as Franconia 'proper', although it was now a much smaller territory than it had previously been. Duke of Lotharingia. Count in Hessi lands. Gebhard of the Hessian Wetterau (also known as Gebhard of Franconia) is confirmed as duke of Lotharingia by Louis the Child, king of Germany, in 903. He is killed in 910 in battle against the Magyars, somewhere in the region of Augsburg. His eldest son is Herman, who becomes duke of Swabia in 926. His younger son succeeds him as count of the Wetterau (from 914) and succeeds Eberhard III, duke of Franconia, as count of Oberlahngau (presumably in 918). This Eberhard remains in control of Franconia, however. Conrad the Elder, duke of Thuringia, is the son of Udo of Neustria. His mother is most likely to be a daughter of Conrad I of Logenahe (832-860). Conrad had also become a count of the Oberlahngau in 886, Hessengau in 897, Gotzfeldgau in 903, Wetterau in 905, and Wormsgau in 906. In gaining all these titles he had united all of the lands of the Hessi and their immediate neighbours under a single political control, creating a bastion of the duchy of Franconia and an entity that will evolve into the landgraviate of Hesse. Now the Conradines defeat the Babenberg counts at the Battle of Fritzlar and establish themselves as dukes of Franconia (the Babenbergs being the descendants of Poppo I of the Grapfeld in early Franconia, and of Henry of Babenberg, count of Franconia in 882-886. Conrad the Elder is killed in the battle. His son, Conrad the Younger succeeds him. Numbering is not generally applied to them, although they are the first and second of that name to govern in Franconia. Unfortunately the numbering system appears to break down quite badly for later Conrads. Son of Udo of Neustria. Duke of Thuringia & Hesse lands. Son. King of Germany (911-918). Count of Hesse lands. The German kingdom of East Francia is formally secured by elected native German rulers. Conrad I is the first to be elected, and a large-scale political reorganisation of south-western Germany creates the stem duchy of Swabia. Conrad hands Franconia into the care of his younger brother, Eberhard. Brother. Count of Hesse lands. Killed. The result of all this chaotic conflict is that Franconia itself is fragmented into separate regions and the title of duke lapses until 1024. The duchy is split into its two main constituent regions, West or Rhenish Franconia (Francia Rhenensis, essentially meaning Franconia near the Rhine), and East Franconia (Francia Orientalis). The eastern half is formed of several counties and bishoprics that that are answerable directly to the German king, while portions of the western half gradually coalesce into an early form of the state of Hesse. It may be now that a large part of East Franconia is considered by the bishops of Würzburg to be within their sphere of authority as Franconia 'proper', although it is much reduced in terms of territory. 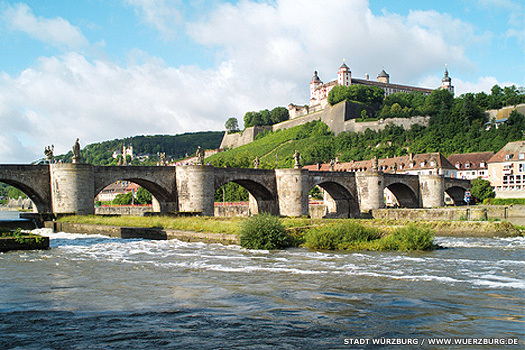 As Würzburg lies at the heart of East Franconia, it is possible that they represent the only viable source of leadership at this time. Some northern areas remain outside their control. As a result of the emperors largely hailing from Franconia, this stem duchy fails to find its footing as a powerful state of its own in line with others such as Saxony (already powerful after delivering a line of emperors), and Swabia (which will provide much of the opposition to the Franconian emperors). To confuse the issue, the Salian counts in Rhenish Franconia to the west are sometimes referred to as dukes of Franconia (Conrad VI being a prime example), but seemingly only after gaining the title Holy Roman emperor and thereby the (eastern) duchy of Franconia. In 1093 their Rhenish Franconian territory is granted as a fief to the palatine count of Aachen, progenitor of the Electoral Palatinate. HRE Conrad II (1024-1039). Conrad I of Carinthia. Son. Duke of Bavaria (VI), Carinthia, & Swabia, & HRE Henry III. Conrad II of Lorraine (1076-1087). With the removal of Swabia from the control of Duke Rudolph, the Frederick's Hohenstaufen family of nobles gains that duchy through his marriage to Agnes of Germany, granddaughter of Henry I the Black. It swiftly becomes one of the most powerful families, holding onto the duchy for most of the remainder of its existence and supplying several Holy Roman emperors. 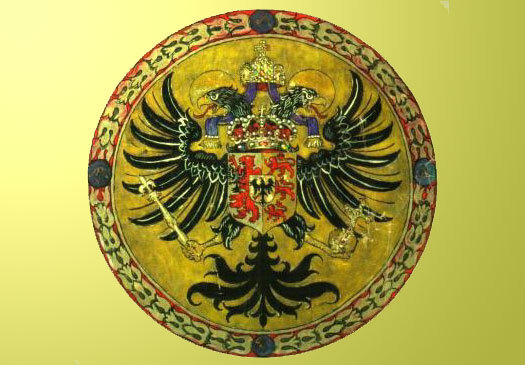 The sons of Louis the Salian (a Rhenish Franconian) are Louis the Springer of Thuringia and Beringer of Sangerhausen. Together they found Kloster Schönrain Abbey in Main Franconia, in which lands their Merovingian ancestors had settled some centuries before. A deed of 1100 names both brothers as counts of Schauenburg. Son. HRE Conrad III (1138-1152). Count Louis III is raised to the rank of landgrave and his Thuringia is recognised as overlord by the Hessians. This unites Hesse and Thuringia from 1130-1247 (clearly to the detriment of Hesse's traditional link with Franconia). The rivalry for the Imperial title between Emperor Lothar and his main rival, Frederick II of Swabia, has a destabilising effect on Germany as a whole. Emperor Lothar and his Hohenstaufen successors in Franconia are supported by Louis I of Thuringia. The county of Württemberg is formed in western central Swabia as another step towards the total disintegration of this duchy during the general political crisis in the country. Because Franconia has provided a power base for the previous dynasty of emperors, it also remains a centre of power for the early Hohenstaufen emperors, Conrad Hohenstaufen and Frederick Barbarossa, thereby preventing it from establishing a clear regional governing structure that might ensure its survival. Duke of Franconia under Conrad. Duke of Franconia under Conrad & Frederick Barbarossa. As an administrative area Franconia gradually collapses, along with large swathes of other German stem duchies. It is broken up into several smaller states which include the semi-independent Hesse and Nassau, with the district administrators, the counts (grafs), assuming more and more regional responsibility and authority. The bishopric of Würzburg also flourishes (and claims the title of duke of Franconia for itself until it is secularised in 1803), as do various minor counties which include Hohenlohe. In 1209 the Teutonic Knights secure a slice of Franconia for their order, known as the bailiwick of Franconia. The Hohenstaufen emperors continue to hold central power in Germany only until 1254, when the political collapse of Germany is complete. A core of Franconia does survive, however, although this is far less important than its larger predecessor. It plays a role in the career of Rudolf of Habsburg and his ducal successors, and contains many imperial cities which form the basis of Franconian Circle which ensures Franconian survival into the modern day. As a name, Franconia remains valid for the region. Following 1806 it is appended to the southern German kingdom of Bavaria, which contains noticeably different dialects and customs from this central German region. The hereditary heirs to the Bavarian throne continue today to add 'duke in Franconia' to their titles.